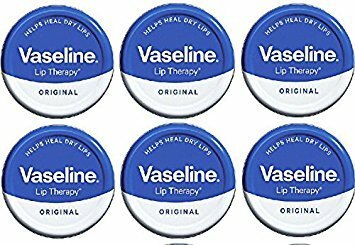 Vaseline Lip Balm 20g/0.705oz (6X20g/0.705oz, Original) by Vaseline at Beauty Sols. MPN: unknown. Hurry! Limited time offer. Offer valid only while supplies last. 1-Vaseline® Lip Therapy® Aloe Tin 0.6 oz Clinically proven to help heal dry lips. Comes in a premium steel tin inspired by our original look. 1-Vaseline® Lip Therapy® Aloe Tin 0.6 oz Clinically proven to help heal dry lips. Comes in a premium steel tin inspired by our original look. Provides long-lasting moisturization to help heal dry lips Non-sticky, non-greasy formula spreads on smoothly Fresh aloe scent delights your senses Gives lips a natural, glossy shine Provides the healing benefits of Vaseline® Jelly in a formula custom-made for lips BEST FOR: DRY, CRACKED LIPS 2-Vaseline® Lip Therapy® Original Tin Clinically proven to help heal dry lips. Comes in a premium steel tin inspired by our original look. Provides long-lasting moisturization to help heal dry lips Non-sticky, non-greasy formula spreads on smoothly Unscented formula Gives lips a natural, glossy shine Provides the healing benefits of Vaseline® Jelly in a formula custom-made for lips BEST FOR: DRY, CRACKED LIPS 3-Vaseline® Lip Therapy® Rosy Lips Tin 0.6 oz Clinically proven to help heal dry lips. Comes in a steel tin inspired by our original look. Provides long-lasting moisturization to help heal dry lips Non-sticky, non-greasy formula spreads on smoothly Sweet fragrance with hints of rose, vanilla, and red berry Gives lips a light tint and natural, glossy shine Provides the healing benefits of Vaseline® Jelly in a formula custom-made for lips BEST FOR: DRY, CRACKED LIPS 4-Vaseline® Lip Therapy® Cocoa Butter Tin Clinically proven to help heal dry lips. Comes in a steel tin inspired by our original look. Provides long-lasting moisturization to help heal dry lips Non-sticky, non-greasy formula spreads on smoothly Appealing cocoa and vanilla scent Gives lips a natural, glossy shine Provides the healing benefits of Vaseline® Jelly in a formula custom-made for lips BEST FOR: DRY, CRACKED LIPS. Made in UK not US. Product formula may different than US.